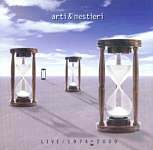 Arti & Mestieri "Live 1974-2000"
Great 2 CD live set from this legendary Italian band. One CD is a really good sounding live show from 1974. The other is a beautiful recording and performance from their 2000 reunion tour with most of the new CD "Murales" as well as gems from both their first two CDs on Cramps. A must for the Italian fan! Notify me of updates to Arti & Mestieri "Live 1974-2000"